Let me begin by saying that I will not be reviewing shows at my alma mater, the School for Contemporary Arts at SFU. I will, however, shamelessly plug them on the internet before I watch them. A lot of changes have occurred since I began at SFU in 2005. My first SFU acting instructor, Marc Diamond, sadly passed away that fall while writing his Alice play. I’ve graduated with my BFA (and lost some of my enthusiasm to the need to not be poor, sadly) and SFU Contemporary Arts has moved from the leaky-roofed old facilities on Burnaby Mountain and into the shiny new Woodwards complex on Hastings Street. Cosmetically, the new SFU theatre spaces are unrecognizable compared to the old SFU Mainstage and its hillbilly little cousin, Studio II. In spite of the new facilities and the new faces gracing SFU’s stages today, Marc’s Alice play, and his beloved partner Penelope Stella’s commitment to realizing it onstage, has remained. 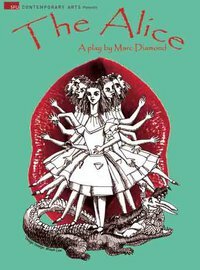 Until March 5, “The Alice: A play by Marc Diamond” is being presented in the Fei and Milton Wong Experimental Theatre as SFU’s Spring 2011 Theatre Mainstage production. Tickets to “The Alice” are very affordable at $10 for Students/Seniors and $15 General Admission. Please note that there are no performances on February 27 or 28. SFU’s Black Box season is the perfect taster for those new to SFU Theatre. The performances are short, free, and go well with whatever else you’ve got planned that evening (drinks afterwords at one of several nearby Gastown pubs, for example). Show 2 of Black Box 2011 is based on the theme of “Community” and runs Friday, February 25 at 7:00 and 9:00, and Saturday, February 26 at 7:00 and 9:00 in SFU Woodward’s Studio T.
If you can’t make it this time round, don’t worry, there will be more shows this season. SFU’s School for the Contemporary Arts has been hidden for far too long atop Burnaby Mountain. They have made the effort to move downtown and join the Vancouver artistic community. If you are curious about the innovative work being created and performed by tomorrow’s contemporary artists, may I humbly suggest that you visit their brand spanking new campus and see what all the fuss is about.